I learned so much about serif, san-serif, html and css. Last year I taught the kids Python, and because I was in the middle of trying to get my book, Treading on Python, out for both Amazon and Barnes and Noble I thought that it might be interesting to teach digital publishing. Basically I would teach them HTML with a few sprinklings of typrography, math and computer science. I decided not to tell them you can basically use Smashwords in combination with Word to create eBooks. That would have been easy, since they are all well versed in Word. But in these days of simple multi-touch phones and tablets I was amazed at the amount of time I would need to spend with basic computer skills. They understood well-formed HTML quickly. But copying a file, or opening it with Notepad was a novel idea. I'm pretty sure that most "computer time" at school is spent playing Flash games or typing in Word. How many of the books are best sellers on Amazon? Well, zero are up there right now. 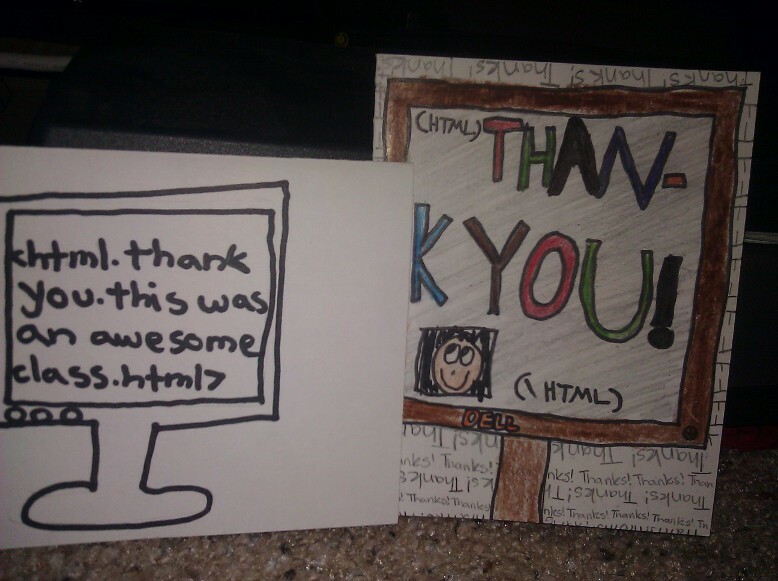 Two students actually "finished" their books, which really consisted of HTML pages. I'm going convert one to epub and mobi so he can throw it on a device. Two other students seemed quite distracted, they were also the youngest so maybe they were intimidated, but they got the basics and just goofed off. 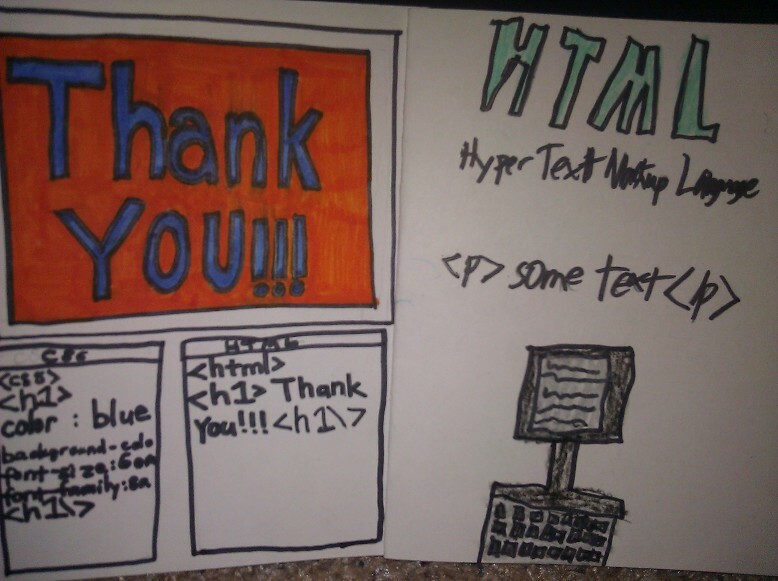 The rest were pretty heads down in writing a story in Notepad using HTML and CSS. It was impressive. They were enclosing all of their paragrahs in tags, tweaking the css, using headers and images. And they even survived having IE as the sole renderer of their work. No firebug goodness to help out. While they didn't walk away with Amazon best sellers, they did learn some basic computer skills and I think they had fun. I've included a few of the cards they sent me when the class was done. Notice the one on the top that has both the HTML rendered as well as the source for the HTML and CSS. Awesome! Some of my class material is available at my github account.